Thank you for your interest in presenting a webinar for NSPE’s PE Institute. PE Institute webinars are an effective way to engage engineering professionals on crucial educational topics and emerging issues. These sessions provide participants with best practices, effective solutions, and quality resources that help them advance in their careers. PE Institute webinars typically run 60 minutes: 50 minutes of learning and five to ten minutes to address participants’ questions. 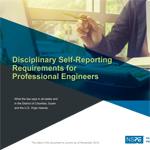 The webinars are promoted to more than 30,000 NSPE members including PEs and those on the path to licensure as well to non-members. Webinars are promoted through various channels including but not limited to e-marketing, social media, and e-newsletters. Please fill out the form below for consideration. You will be contacted within a few weeks about the status of your proposal. If you have any questions about this form or webinars, please contact the Education and Meetings Department at education@nspe.org. Has the content been presented or published by you or anyone else as a webinar or in a different format before?